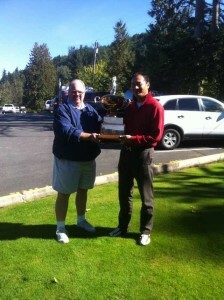 Leon Xu attended the 80th Annual Jack Walters’ Champion of Champions at Enumclaw Golf Course last Sunday, September 30, 2012. This was the golf event in which only the Men’s and Women’s Club Champions determined during 2012 were eligible to participate. He beated all the golfers and won the Champion of Champions title at the score of 69 par and -1 under standard par. We are proud of his sweeping win in this competition. In this traditional and pretigious 80 year golf event, finally there is a champion with a Chinese name! Congratulations Leon!!! This is the way to go!